I remember when we first moved to Germany, we had to completely reorient ourselves to food. Not because of the cuisine so much, but because of the availability. I had to get used to our new German grocery store and reading the labels in German, and there were some recipes that I couldn't make as often because the ingredients weren't as easy to come by. We also had to find new fast food. Whereas in Virginia we relied on Chinese food, pizza, and fried chicken, we now had kebap shops and bakery sandwiches for takeaway. 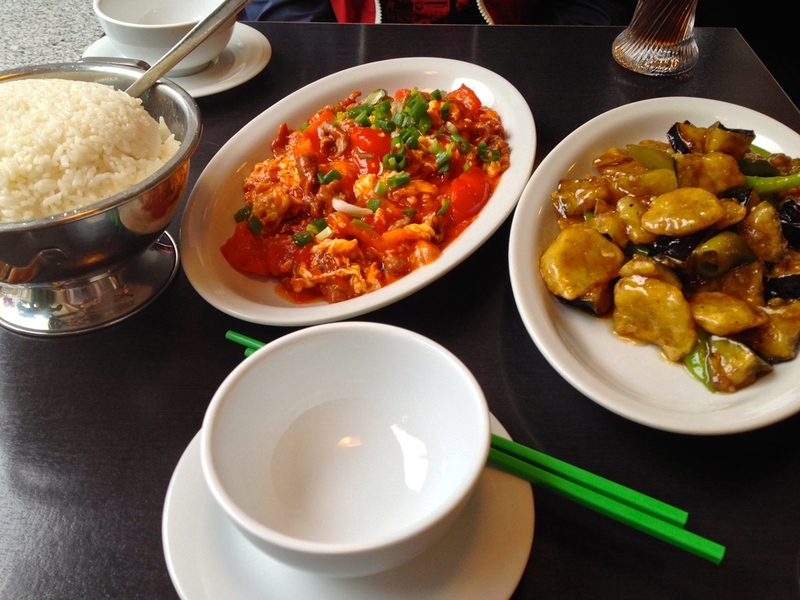 About the second or third month of living here, we craved our old staples, and that's when we started our quest for good Chinese food. As I imagine it is the case with most imported cuisines, German Chinese food is nothing like American Chinese food. For one thing, you won't find names like "lo mein" or "General Tso's chicken" on the menu. And once you do find the noodle dish that resembles lo mein, you'll find that it doesn't have the same (for lack of a better word) greasiness that's the mouth-watering hallmark of American Chinese food. We soon learned this after visiting a popular Chinese restaurant downtown, followed by another Chinese buffet on our street, and neither fit the bill. Luckily, we gave Shabu Shabu a try, and it has been our favorite ever since. Part of the appeal for us is that Shabu Shabu is located just down from our apartment. The interior of the restaurant is bright and modern, and during the warm summer months they also have a few patio tables outside that make visiting them extra nice for when we have Leo. That said, they've always welcomed us inside the restaurant with him, and the waitress/owner is always very kind and friendly towards Leo when we bring him. We've tried a number of dishes from Shabu Shabu over the past couple of years, but my favorites continue to be the eggplant with peppers (S24) and the pork belly with fried tofu (S40). The eggplant dish is lovely because the ingredients are so fresh. You get a generous serving of perfectly cooked eggplant mixed with Anaheim chili peppers in a light brown sauce. When I'm feeling like a meat dish, I like the pork belly with fried tofu because it combines a blend a textures, including the soft fat around the stringy pork and springy tofu. It also comes win a light brown sauce with bok choy and carrots. Both come with steamed rice, and I always add a little of the smokey soy sauce and chili sauce that comes on the table to spice up my meal. You can't go wrong with most of the dishes on the menu, which range from basic Chinese to both Chinese and Korean specialties. Matt enjoys the fried noodles (73) because they're the best that we've have yet in Germany (though still not quite like the lo mein we were used to in the States). We've also tried other dishes like the tofu with kimchi (S23), potatoes and chicken (S32--beware the bones! ), pork belly with glass noodles (S37), Korean fried tofu with vegetables (S61), noodle soup with beef (S93), and beef with tomatoes and egg (S107). The menu also conveniently has some beautiful high-quality photos of all of the speciality dishes to help make your choice easier (or harder, depending on whether or not you're as indecisive as I am). I can't enjoy a meal with the sauce caddy -- smokey soy sauce and chili sauce. We've also had the mini spring rolls appetizer, but don't bother. I find that Germans aren't as big on appetizers, culturally speaking, and so in general they aren't really done well here in most everyday restaurants. For drinks we usually stick with beer or riesling. Shabu Shabu also do a lunch buffet, hot pot buffet, and Korean BBQ, but we're usually too late for the buffet and forget to call ahead for the hot pot. One of these days I'll remember, and I'm sure we'll find those dishes equally as tasty. Shabu Shabu is located on Charlottenstraße 26. Is just next to the Olgaeck U-bahn stop, and easily accessible from Charlottenplatz. They're open for both lunch and dinner, but close between 3:30 and 5:30 pm between shifts on Mondays-Fridays. The very friendly staff speaks some English, and you can ask for the menu in English, as well.